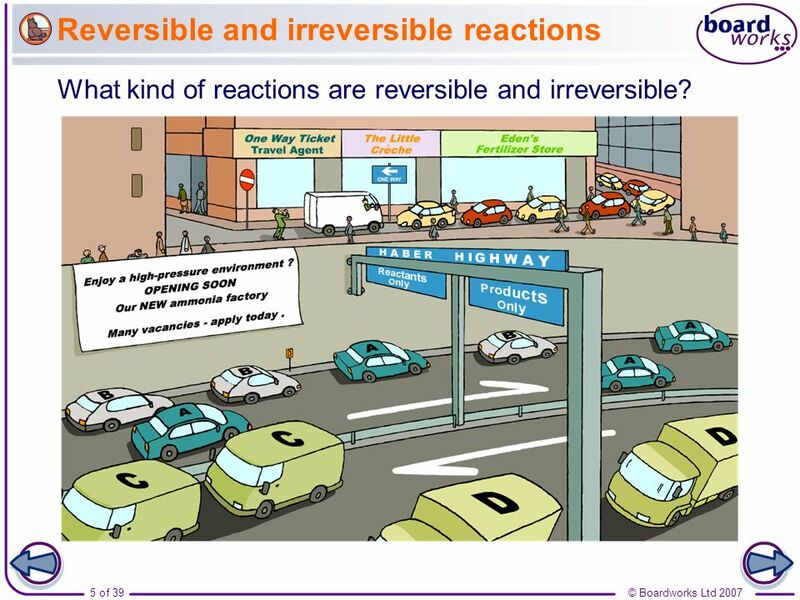 4 What are reversible reactions? 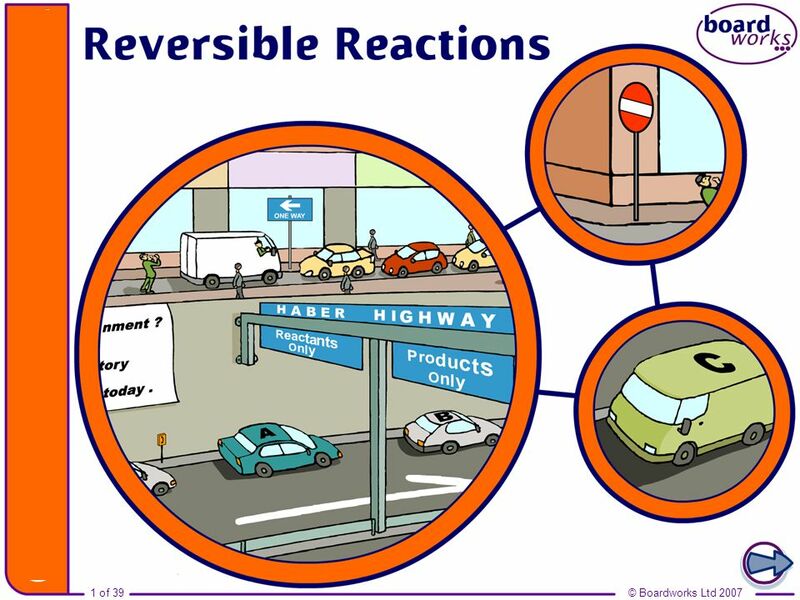 Boardworks GCSE Additional Science: Chemistry Reversible Reactions Reversible reactions occur when the backwards reaction (products  reactants) takes place relatively easily under certain conditions. The products turn back into the reactants. 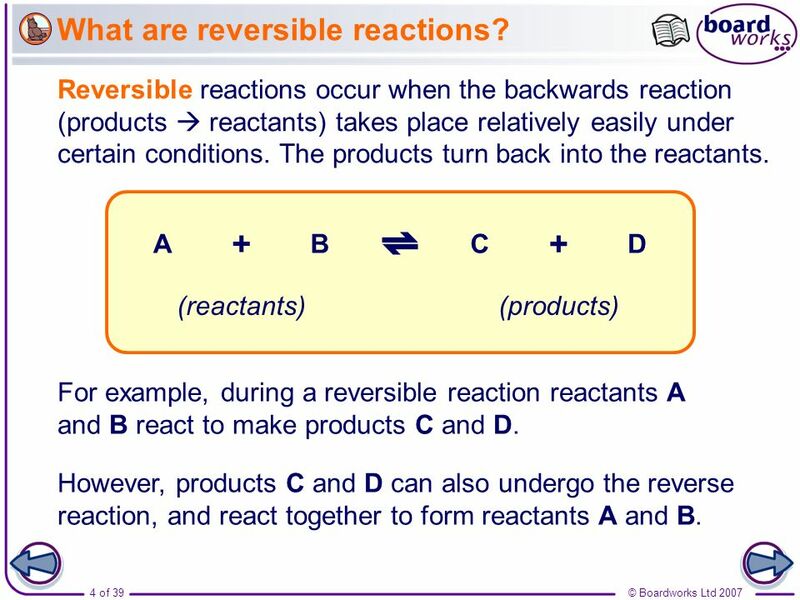 + A B C D (reactants) (products) For example, during a reversible reaction reactants A and B react to make products C and D. Teacher notes In equations for reversible reactions, reactants and products are joined by a ‘two-way’ arrow. 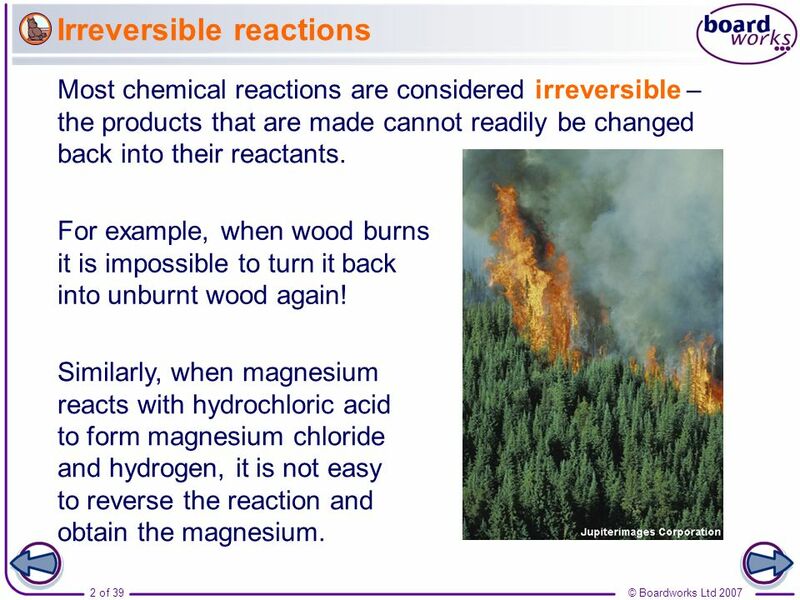 However, products C and D can also undergo the reverse reaction, and react together to form reactants A and B.
Boardworks GCSE Additional Science: Chemistry Reversible Reactions What kind of reactions are reversible and irreversible? 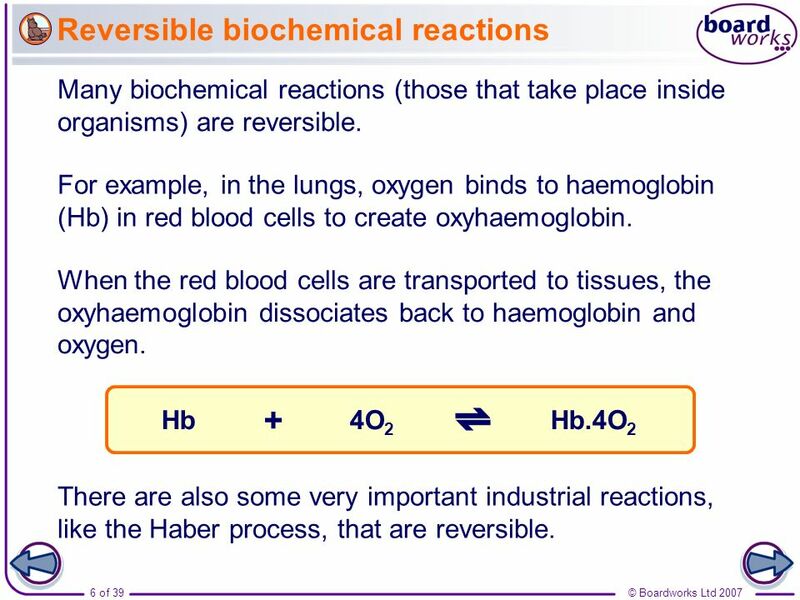 Boardworks GCSE Additional Science: Chemistry Reversible Reactions Many biochemical reactions (those that take place inside organisms) are reversible. For example, in the lungs, oxygen binds to haemoglobin (Hb) in red blood cells to create oxyhaemoglobin. When the red blood cells are transported to tissues, the oxyhaemoglobin dissociates back to haemoglobin and oxygen. 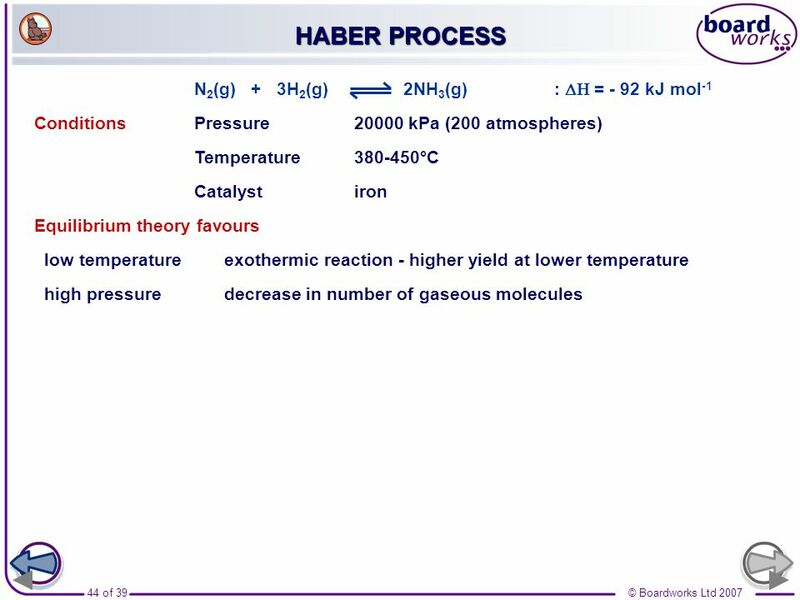 Hb + 4O2 Hb.4O2 There are also some very important industrial reactions, like the Haber process, that are reversible. 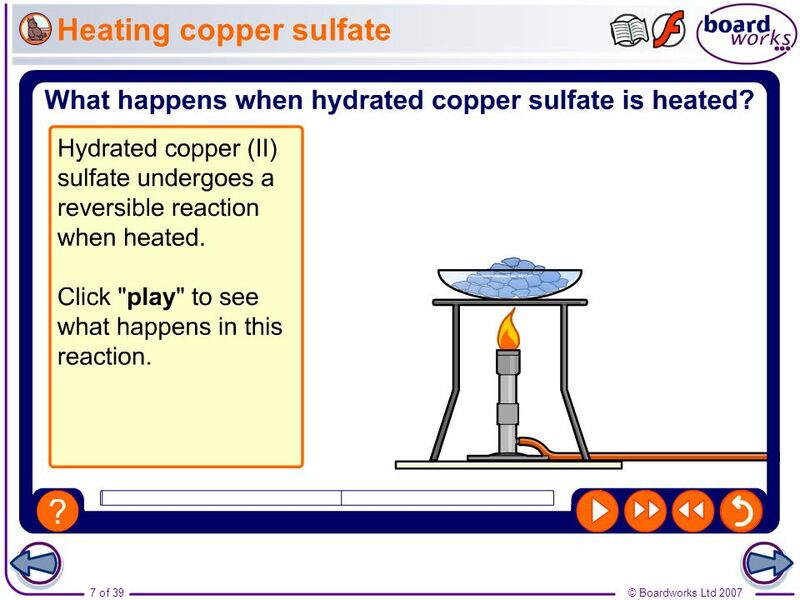 Boardworks GCSE Additional Science: Chemistry Reversible Reactions Teacher notes This animation can be used to introduce the heating of hydrated copper (II) sulfate, and subsequent rehydration of anhydrous copper (II) sulfate as an example of a reversible reaction. It could be shown as precursor to running the experiment in the lab, or as a revision exercise. 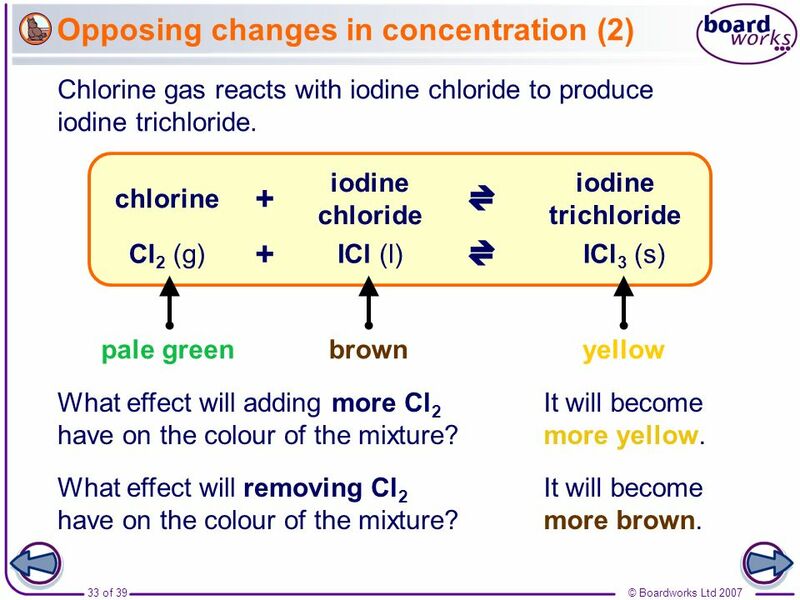 Boardworks GCSE Additional Science: Chemistry Reversible Reactions Teacher notes Appropriately coloured voting cards could be used with this classification activity to increase class participation. True or false? 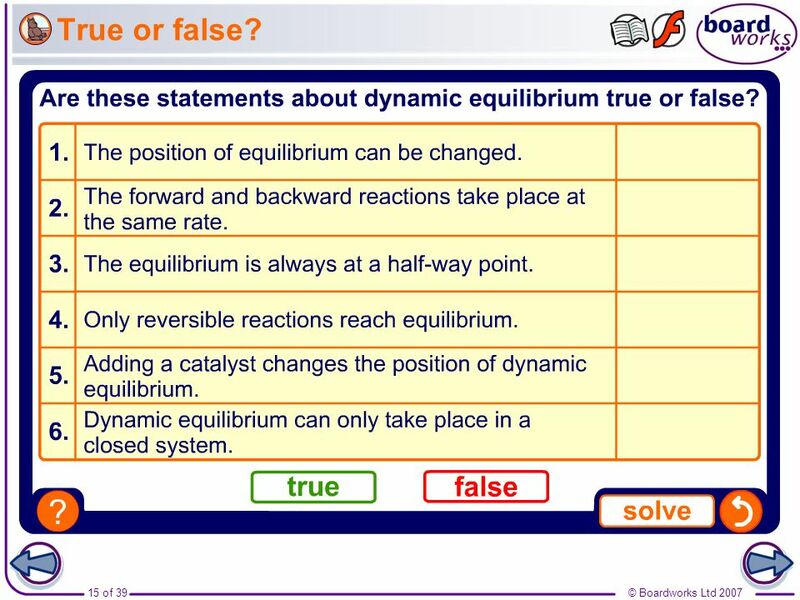 Boardworks GCSE Additional Science: Chemistry Reversible Reactions Teacher notes This true-or-false activity could be used as a plenary or revision exercise on dynamic equilibrium, or at the start of the lesson to gauge students’ existing knowledge of the subject matter. Coloured traffic light cards (red = false, yellow = don’t know, green = true) could be used to make this a whole-class exercise. 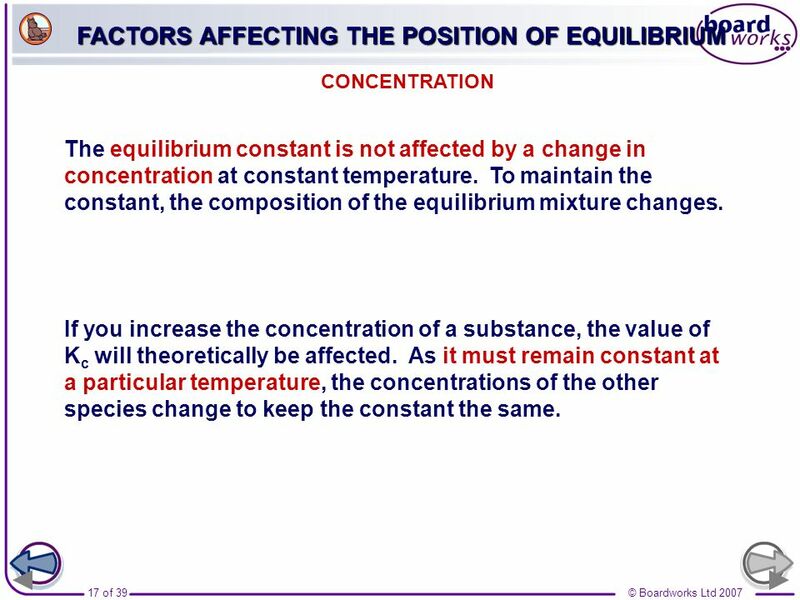 CONCENTRATION The equilibrium constant is not affected by a change in concentration at constant temperature. 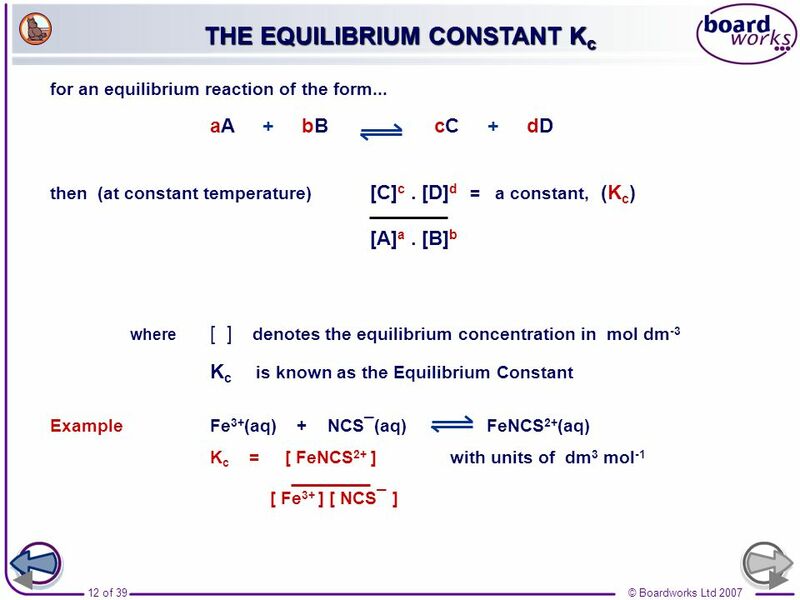 To maintain the constant, the composition of the equilibrium mixture changes. 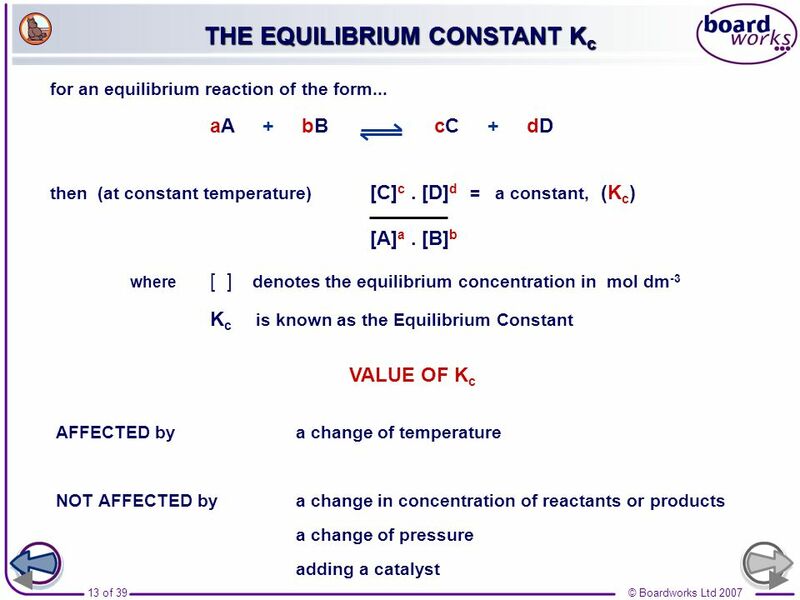 If you increase the concentration of a substance, the value of Kc will theoretically be affected. As it must remain constant at a particular temperature, the concentrations of the other species change to keep the constant the same. 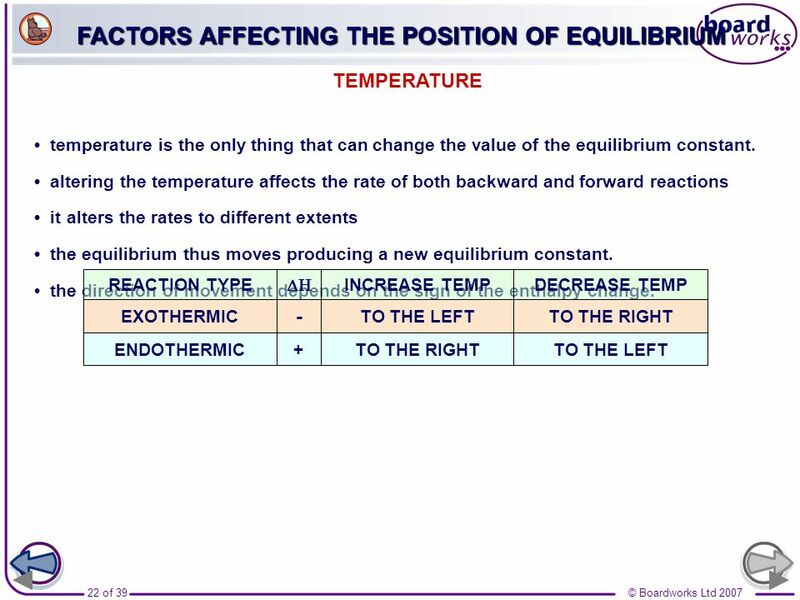 TEMPERATURE • temperature is the only thing that can change the value of the equilibrium constant. 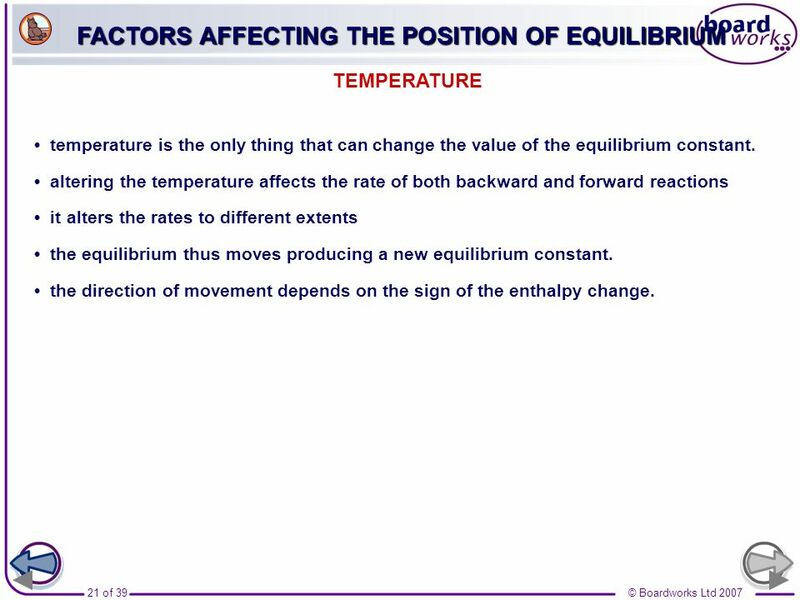 • altering the temperature affects the rate of both backward and forward reactions • it alters the rates to different extents • the equilibrium thus moves producing a new equilibrium constant. • the direction of movement depends on the sign of the enthalpy change. CATALYSTS An increase in temperature is used to speed up chemical reactions but it can have an undesired effect when the reaction is reversible and exothermic. 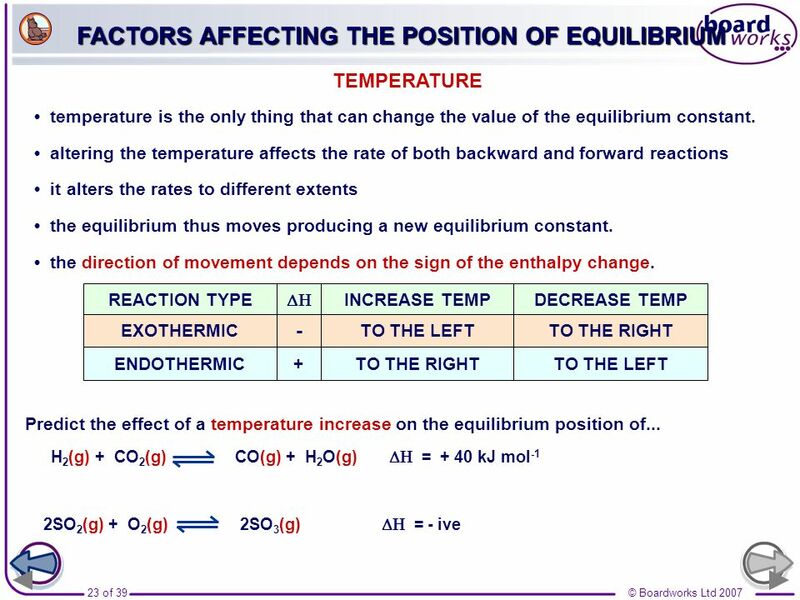 In this case you get to the equilibrium position quicker but with a reduced yield because the increased temperature moves the equilibrium to the left. 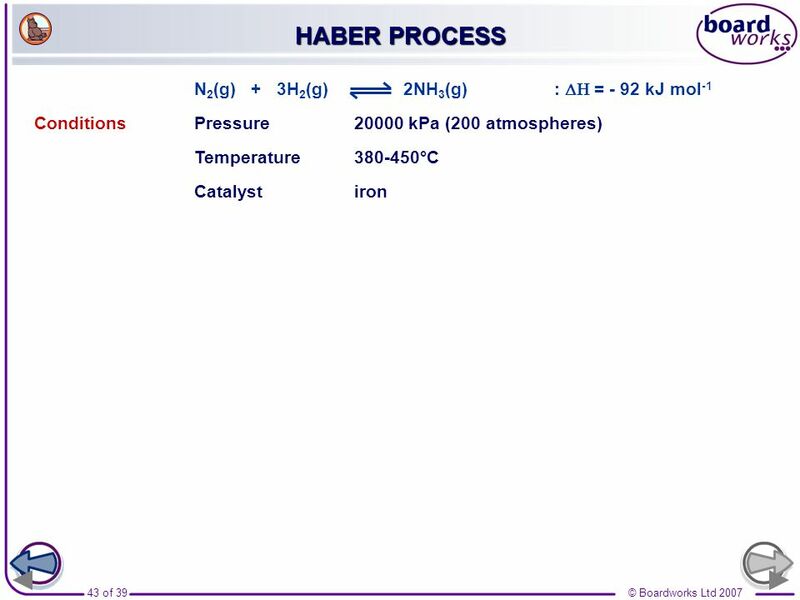 In many industrial processes a compromise temperature is used (see Haber and Contact Processes). 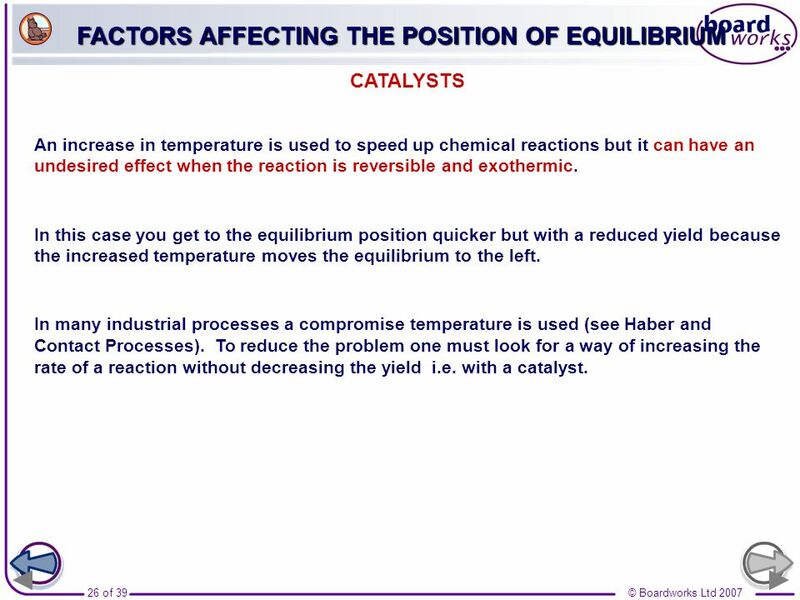 To reduce the problem one must look for a way of increasing the rate of a reaction without decreasing the yield i.e. with a catalyst. CATALYSTS An increase in temperature is used to speed up chemical reactions but it can have an undesired effect when the reaction is reversible and exothermic. 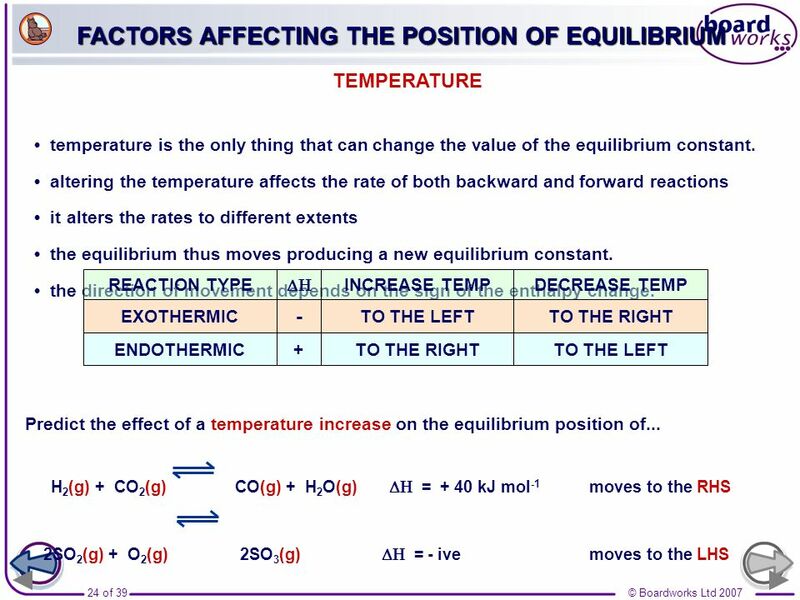 In this case you get to the equilibrium position quicker but with a reduced yield because the increased temperature moves the equilibrium to the left. 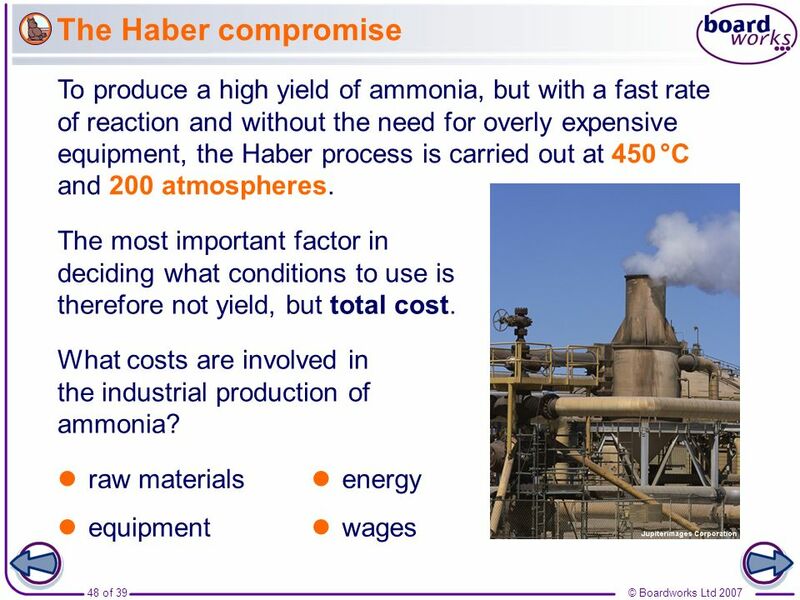 In many industrial processes a compromise temperature is used (see Haber and Contact Processes). To reduce the problem one must look for a way of increasing the rate of a reaction without decreasing the yield i.e. with a catalyst. 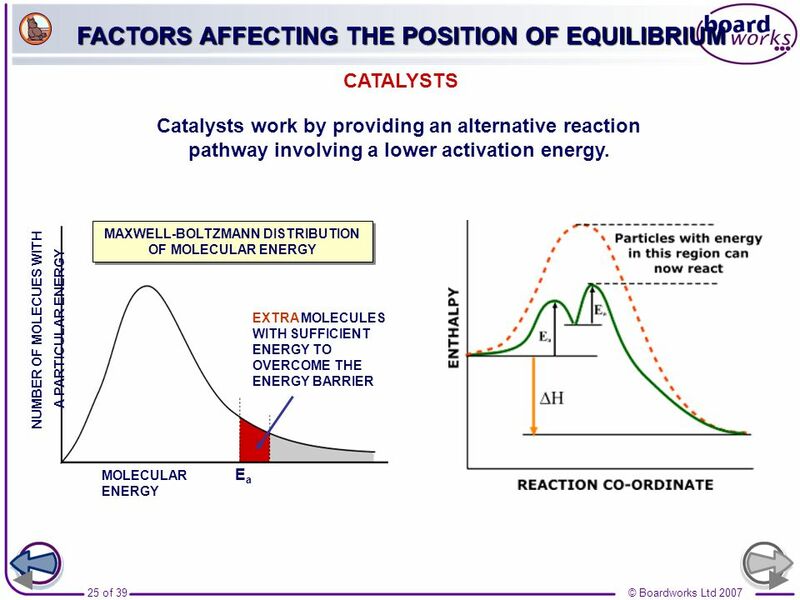 Adding a catalyst DOES NOT AFFECT THE POSITION OF EQUILIBRIUM. 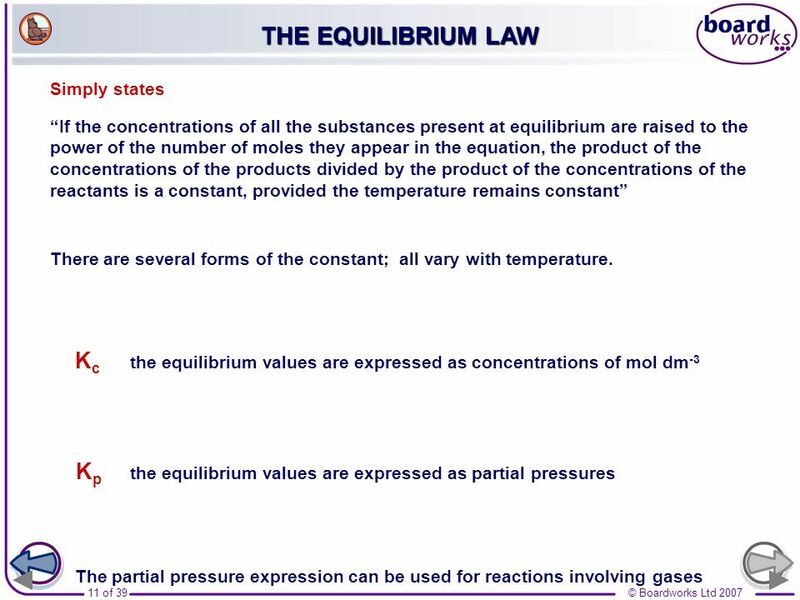 However, it does increase the rate of attainment of equilibrium. 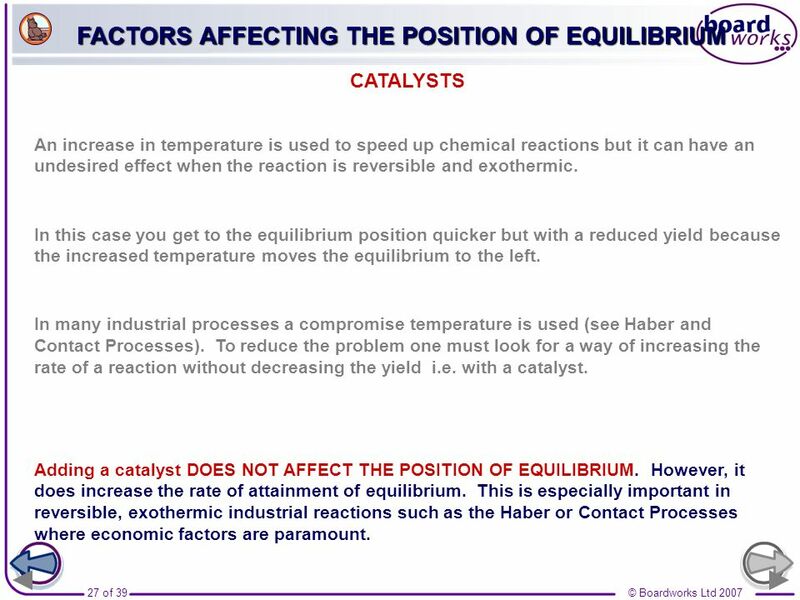 This is especially important in reversible, exothermic industrial reactions such as the Haber or Contact Processes where economic factors are paramount. 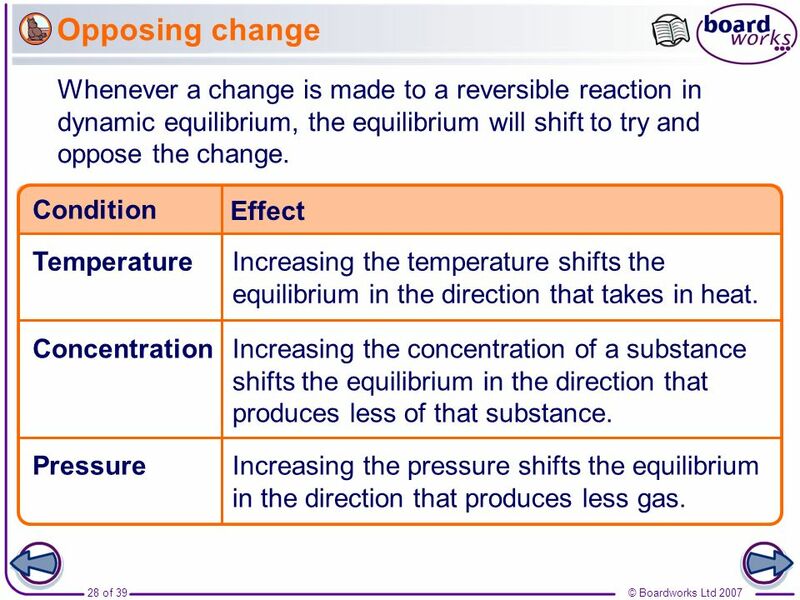 Opposing change Boardworks GCSE Additional Science: Chemistry Reversible Reactions Whenever a change is made to a reversible reaction in dynamic equilibrium, the equilibrium will shift to try and oppose the change. Temperature Concentration Pressure Condition Effect Increasing the temperature shifts the equilibrium in the direction that takes in heat. 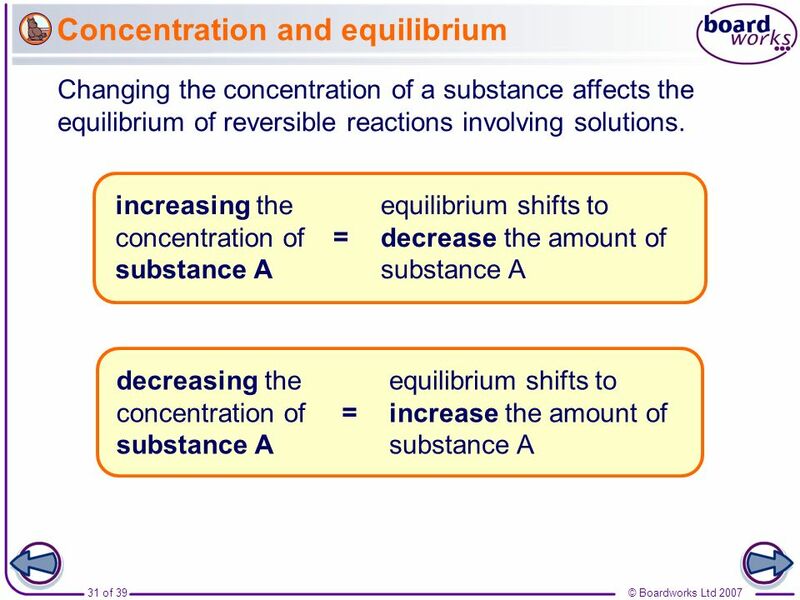 Increasing the concentration of a substance shifts the equilibrium in the direction that produces less of that substance. 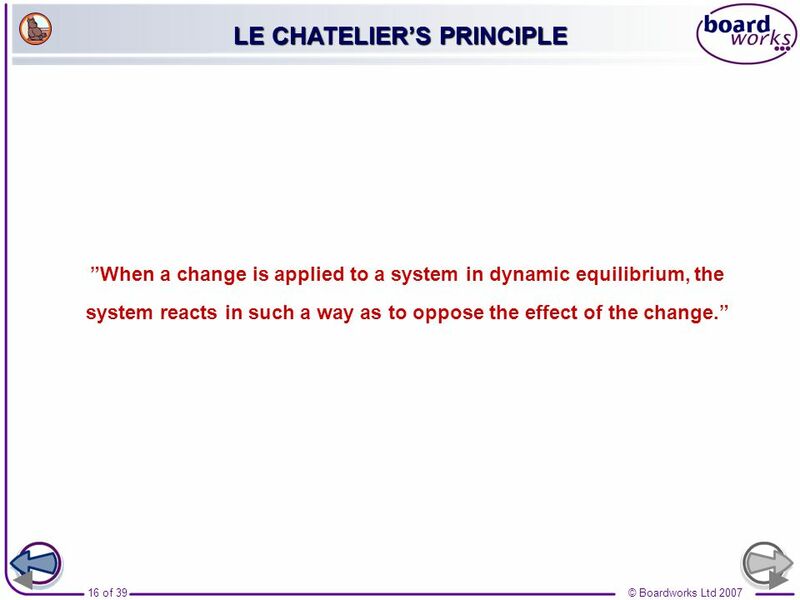 Teacher notes This is Le Chatelier’s principle. 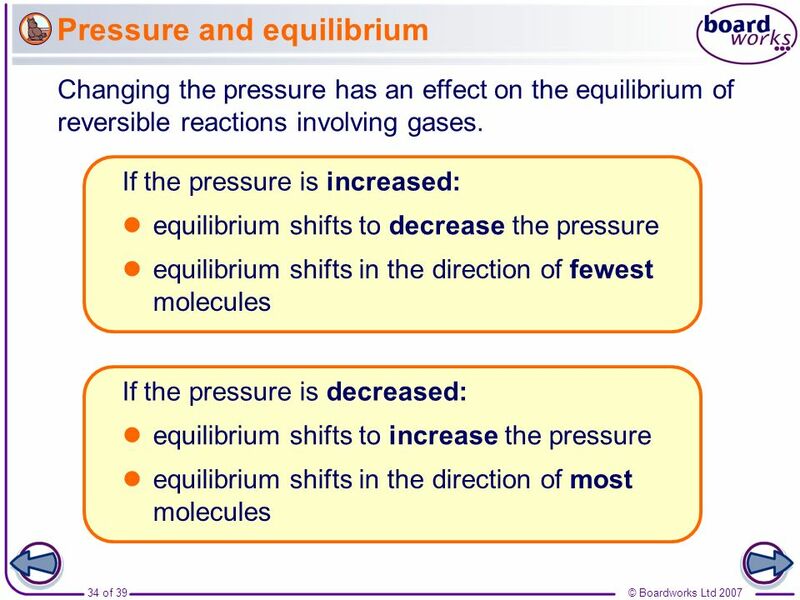 Increasing the pressure shifts the equilibrium in the direction that produces less gas. Boardworks GCSE Additional Science: Chemistry Reversible Reactions Nitrogen dioxide is in constant equilibrium with dinitrogen tetroxide. 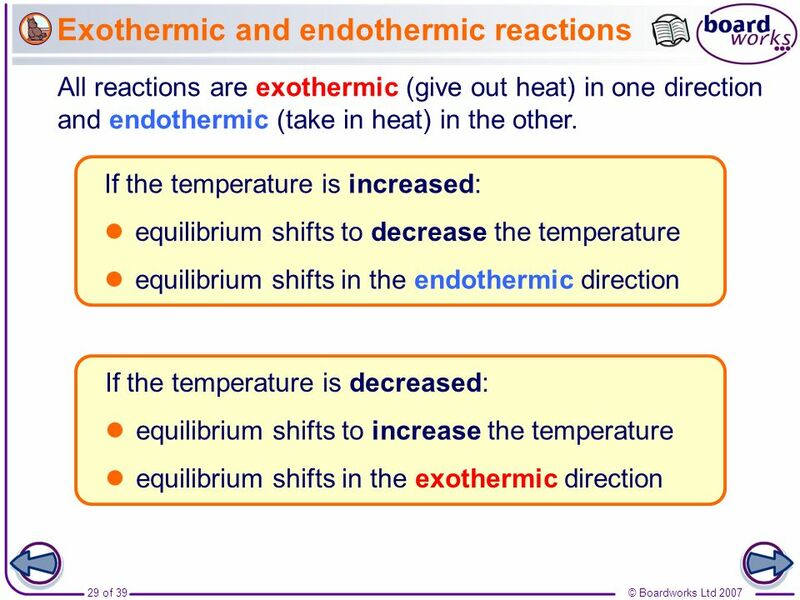 The forward reaction is exothermic and the backwards reaction is endothermic. 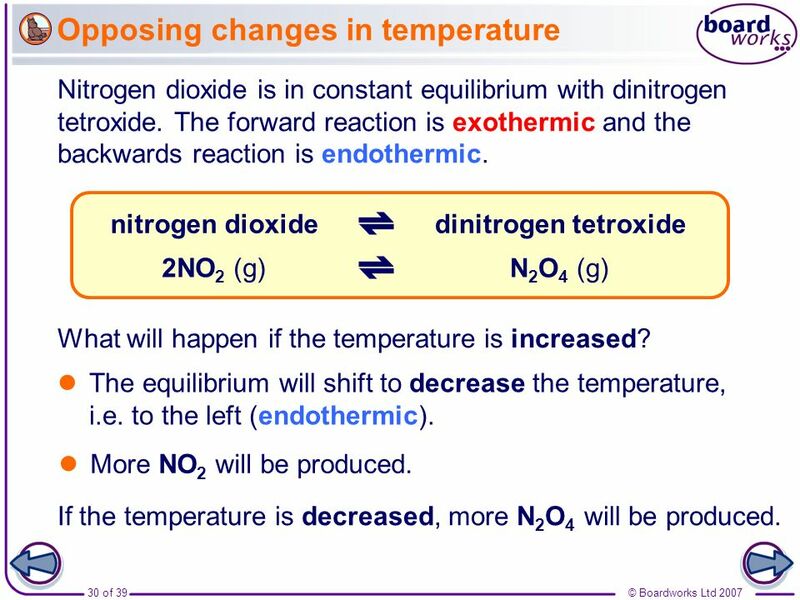 N2O4 (g) 2NO2 (g) nitrogen dioxide dinitrogen tetroxide What will happen if the temperature is increased? The equilibrium will shift to decrease the temperature, i.e. to the left (endothermic). More NO2 will be produced. If the temperature is decreased, more N2O4 will be produced. Boardworks GCSE Additional Science: Chemistry Reversible Reactions Bismuth chloride reacts with water to produce a white precipitate of bismuth oxychloride and hydrochloric acid. bismuth oxychloride bismuth chloride water hydrochloric acid + BiOCl (s) BiCl3 (aq) H2O (l) 2HCl (aq) What will happen if more H2O is added? The equilibrium will shift to decrease the amount of water, i.e. to the right. More BiOCl and HCl will be produced. 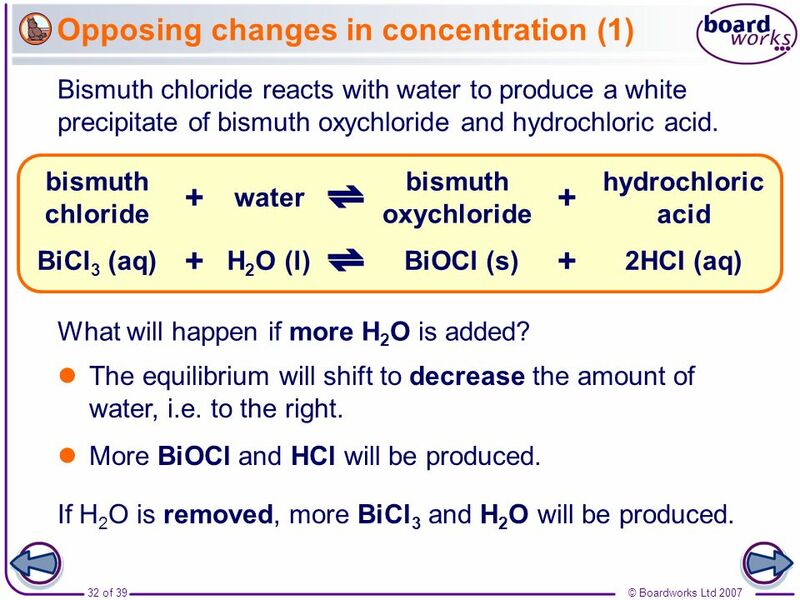 If H2O is removed, more BiCl3 and H2O will be produced. Boardworks GCSE Additional Science: Chemistry Reversible Reactions Chlorine gas reacts with iodine chloride to produce iodine trichloride. iodine trichloride chlorine iodine chloride + ICl3 (s) Cl2 (g) ICl (l) pale green brown yellow What effect will adding more Cl2 have on the colour of the mixture? It will become more yellow. What effect will removing Cl2 have on the colour of the mixture? It will become more brown. Boardworks GCSE Additional Science: Chemistry Reversible Reactions Nitrogen dioxide is in constant equilibrium with dinitrogen tetroxide. Two molecules of nitrogen dioxide react to form one molecule of dinitrogen tetroxide. 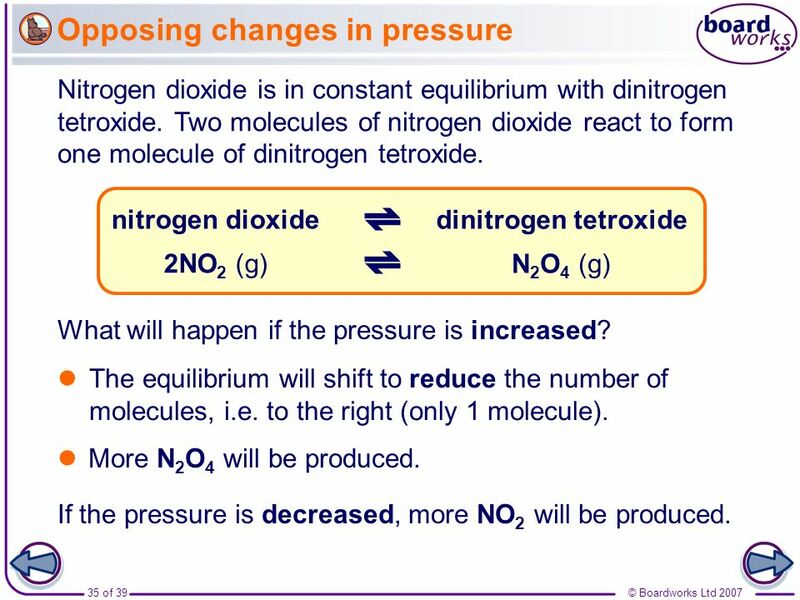 N2O4 (g) 2NO2 (g) dinitrogen tetroxide nitrogen dioxide What will happen if the pressure is increased? The equilibrium will shift to reduce the number of molecules, i.e. to the right (only 1 molecule). More N2O4 will be produced. If the pressure is decreased, more NO2 will be produced. 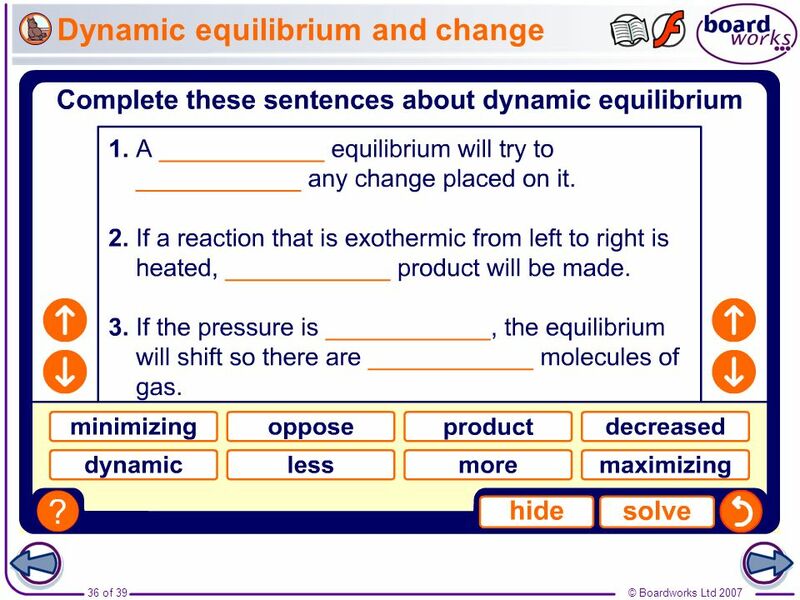 Boardworks GCSE Additional Science: Chemistry Reversible Reactions Teacher notes This completing sentences activity could be used as a plenary or revision exercise on dynamic equilibrium. Students could be asked to write down the missing words in their books and the activity could be concluded by the completion on the IWB. 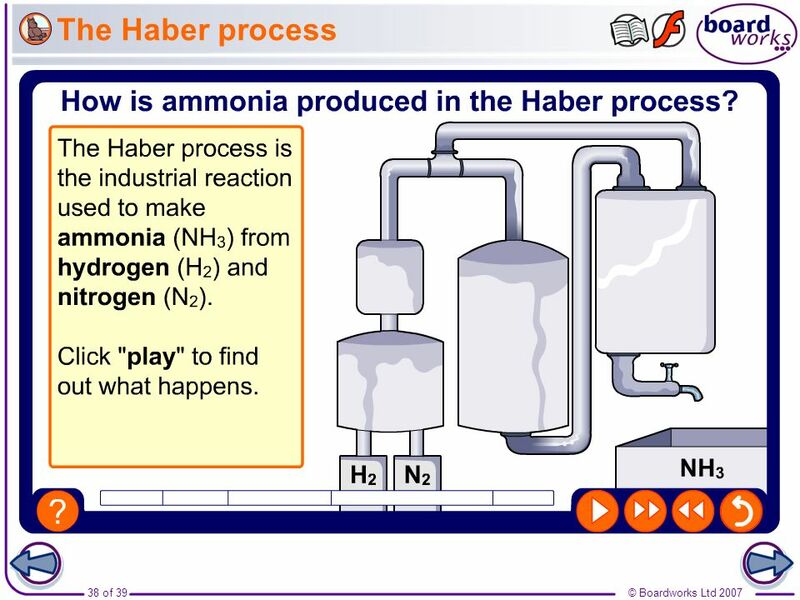 The Haber process Boardworks GCSE Additional Science: Chemistry Reversible Reactions Teacher notes This five-stage animation illustrates how ammonia is made in the Haber process. What is yield? 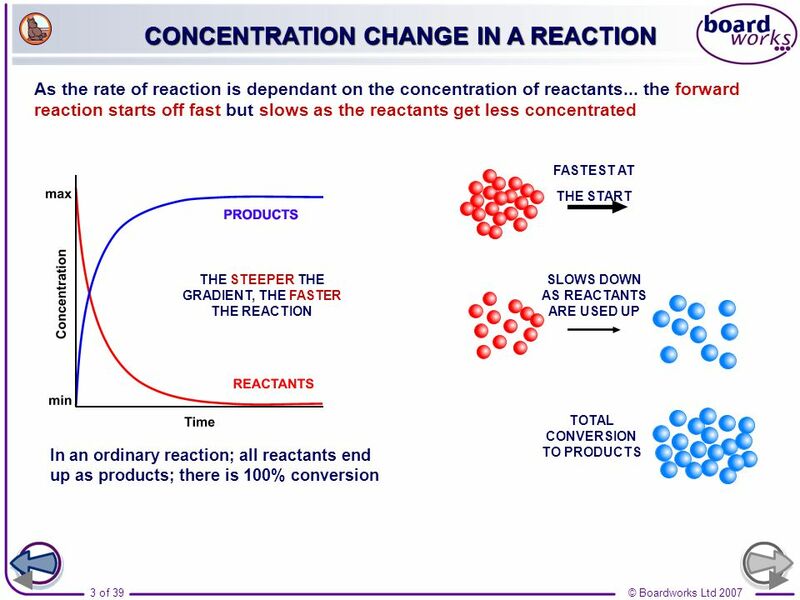 Boardworks GCSE Additional Science: Chemistry Reversible Reactions The amount of product made in a reaction is called the yield and is usually expressed as a percentage. 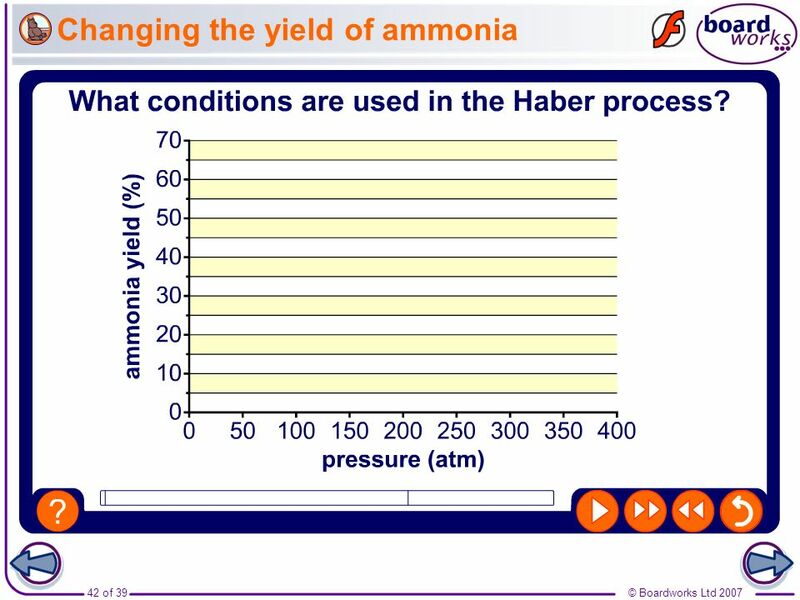 The yield of ammonia produced by the Haber process depends on the temperature and pressure of the reaction. 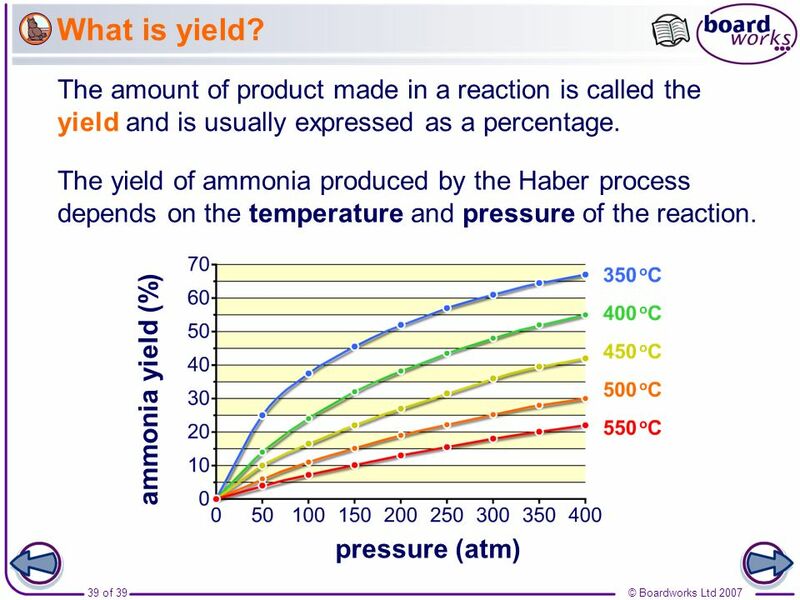 ammonia yield (%) pressure (atm) Teacher notes See the ‘Quantitative Chemistry’ presentations for more information on yields. 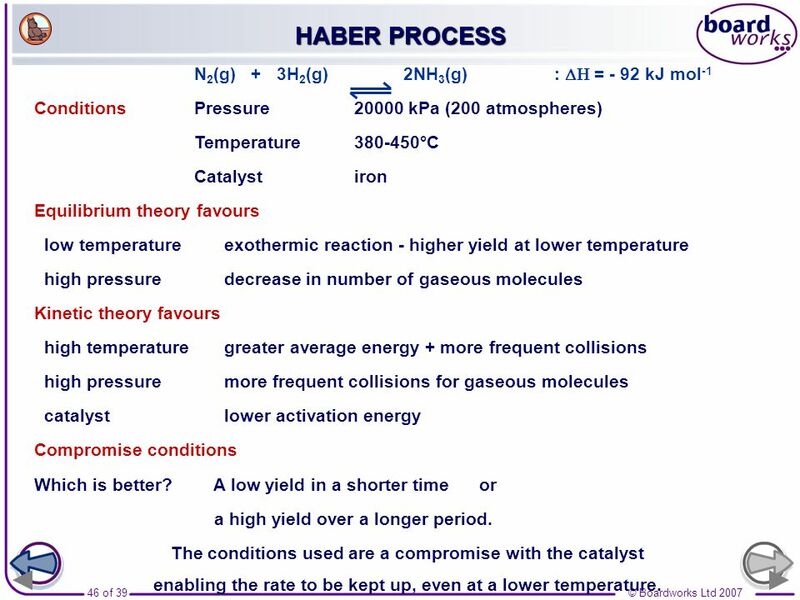 40 What is the Haber compromise? 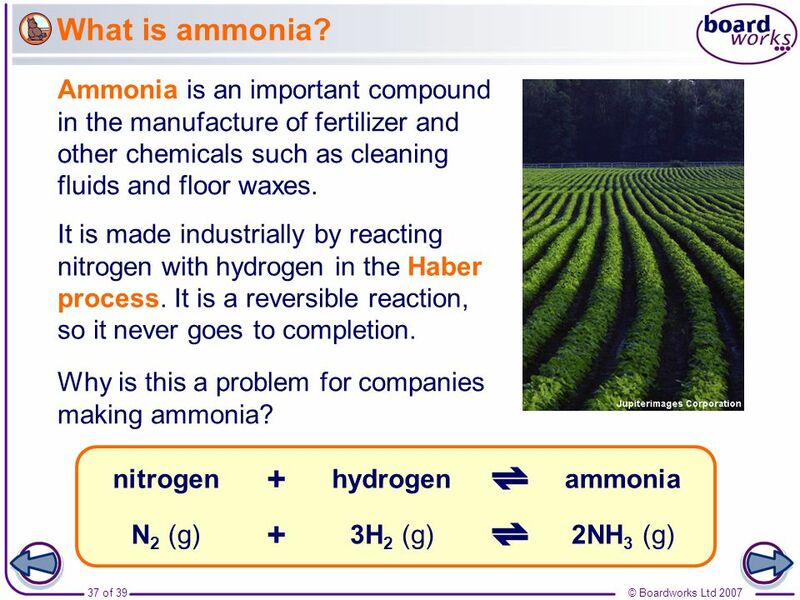 Boardworks GCSE Additional Science: Chemistry Reversible Reactions The highest yield of ammonia is theoretically produced by using a low temperature and a high pressure. In practice, though, these conditions are not used. Why? Lowering the temperature slows down the rate of reaction. This means it takes longer for ammonia to be produced. Increasing the pressure means stronger, more expensive equipment is needed. 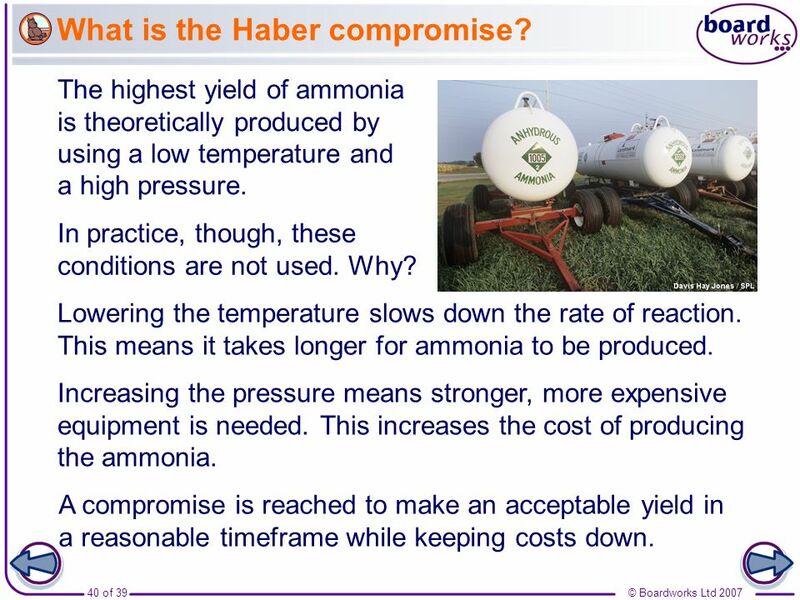 This increases the cost of producing the ammonia. Photo credit: Davis Hay Jones / Science Photo Library A compromise is reached to make an acceptable yield in a reasonable timeframe while keeping costs down. 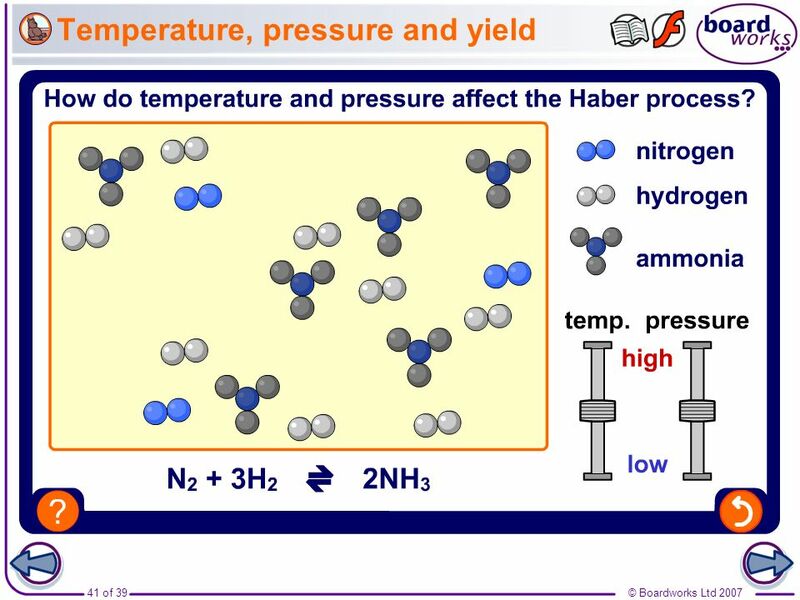 Boardworks GCSE Additional Science: Chemistry Reversible Reactions Teacher notes This activity could be used as a plenary or revision exercise on the effects of temperature and pressure on the Haber process. 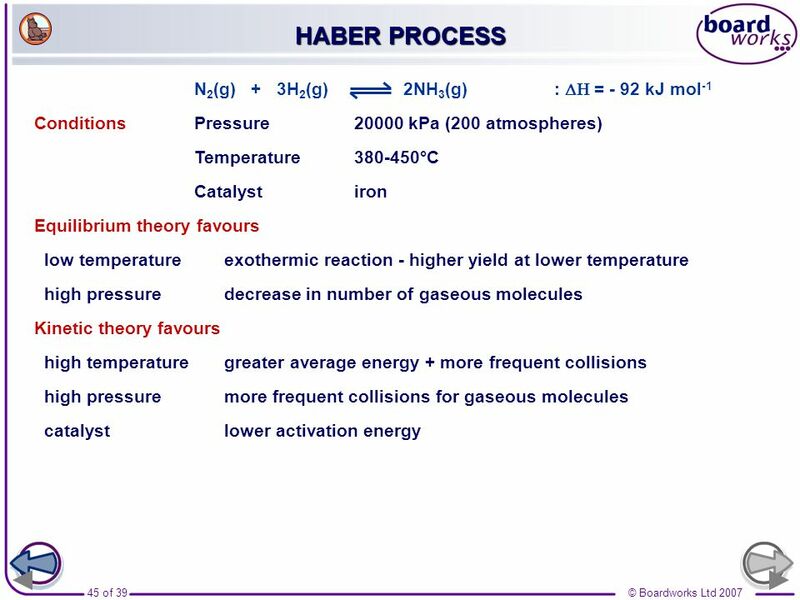 Conditions	Pressure kPa (200 atmospheres) Temperature °C Catalyst	iron Equilibrium theory favours low temperature exothermic reaction - higher yield at lower temperature high pressure decrease in number of gaseous molecules Kinetic theory favours high temperature greater average energy + more frequent collisions high pressure more frequent collisions for gaseous molecules catalyst lower activation energy Compromise conditions Which is better? A low yield in a shorter time or a high yield over a longer period. The conditions used are a compromise with the catalyst enabling the rate to be kept up, even at a lower temperature. 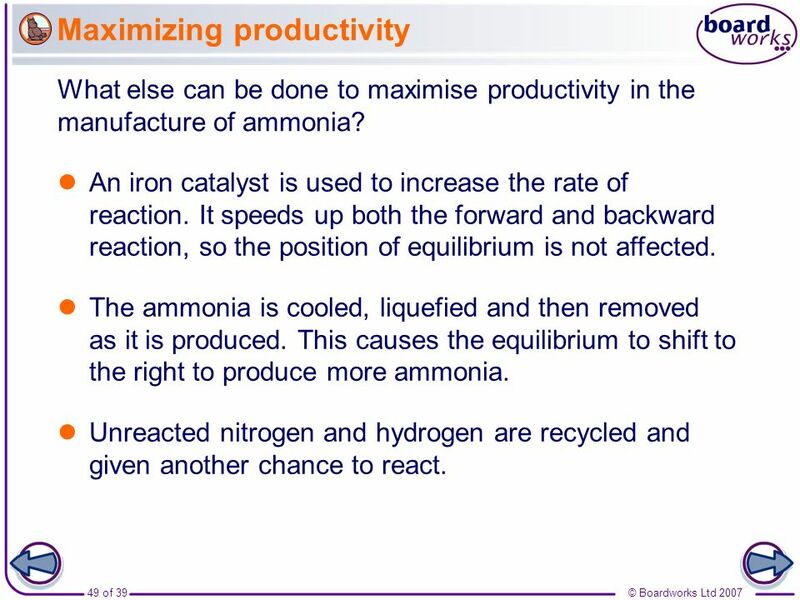 Boardworks GCSE Additional Science: Chemistry Reversible Reactions What else can be done to maximise productivity in the manufacture of ammonia? An iron catalyst is used to increase the rate of reaction. 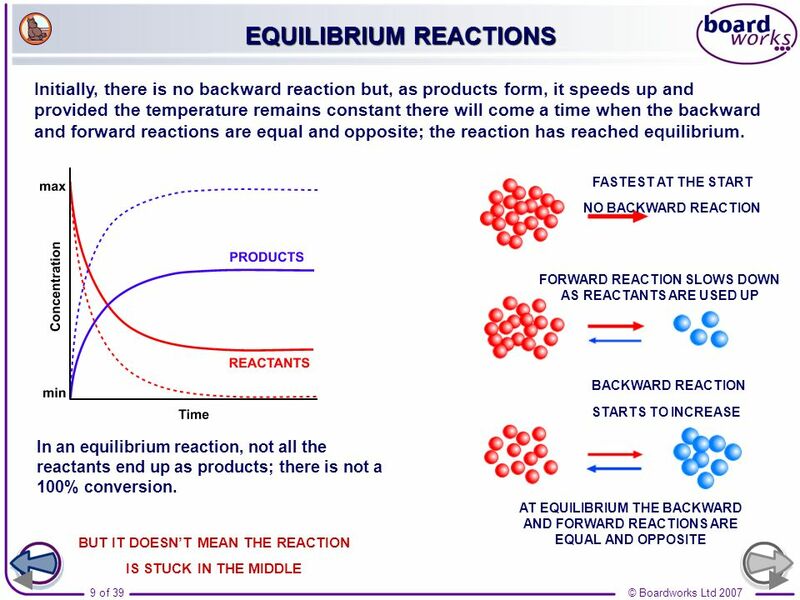 It speeds up both the forward and backward reaction, so the position of equilibrium is not affected. 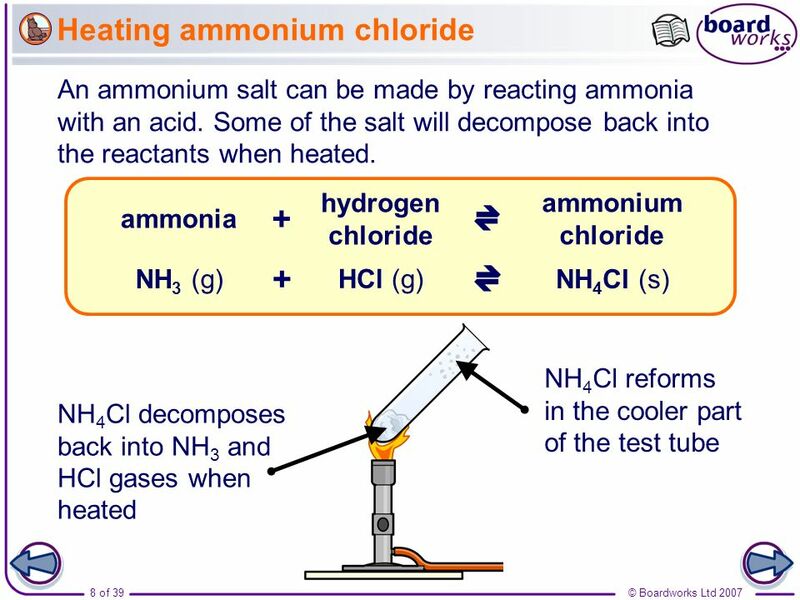 The ammonia is cooled, liquefied and then removed as it is produced. 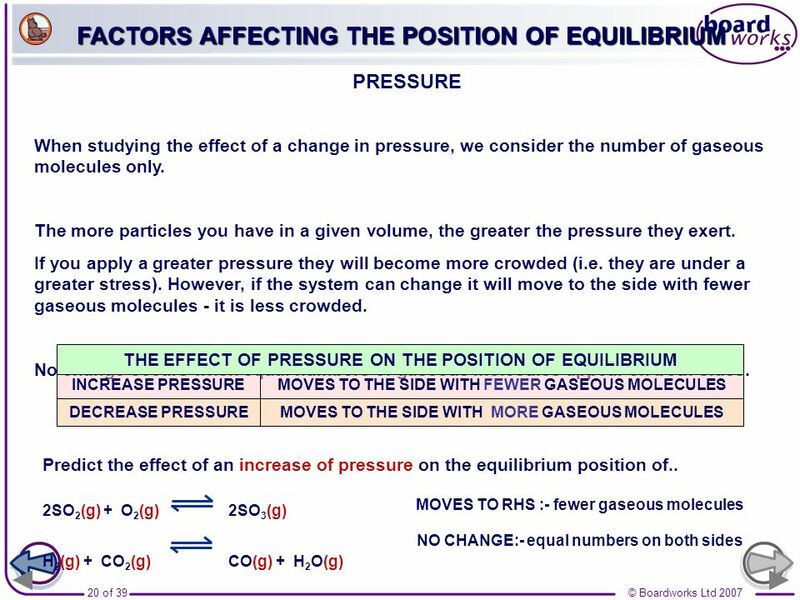 This causes the equilibrium to shift to the right to produce more ammonia. Unreacted nitrogen and hydrogen are recycled and given another chance to react. 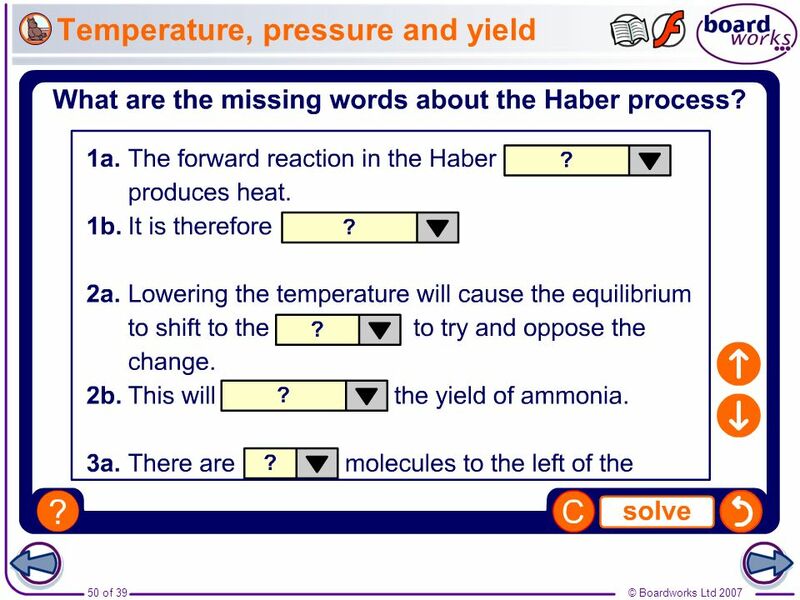 Boardworks GCSE Additional Science: Chemistry Reversible Reactions Teacher notes This completing sentences activity could be used as a plenary or revision exercise on the Haber process. Students could be asked to write down the missing words in their books and the activity could be concluded by the completion on the IWB. 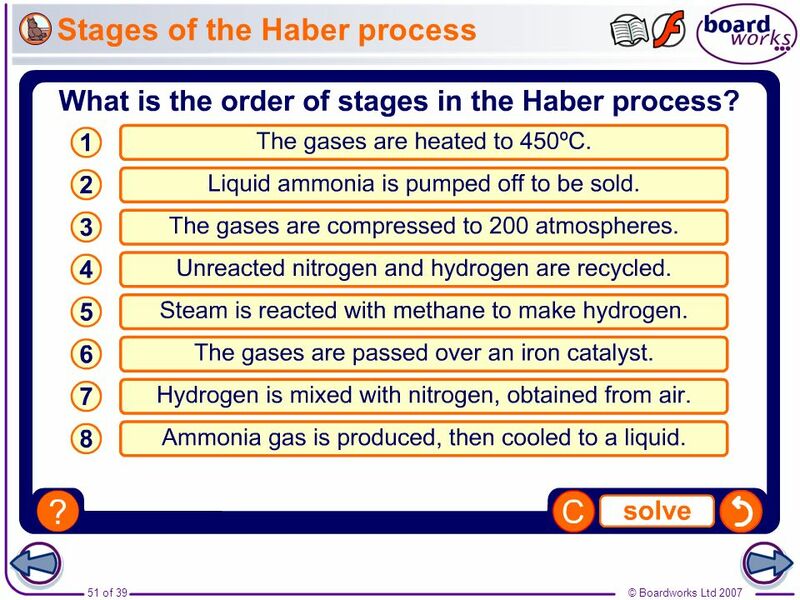 Boardworks GCSE Additional Science: Chemistry Reversible Reactions Teacher notes This ordering activity could be used as a plenary or revision exercise on the stages in the Haber process. Mini-whiteboards could be used to make this a whole-class exercise. 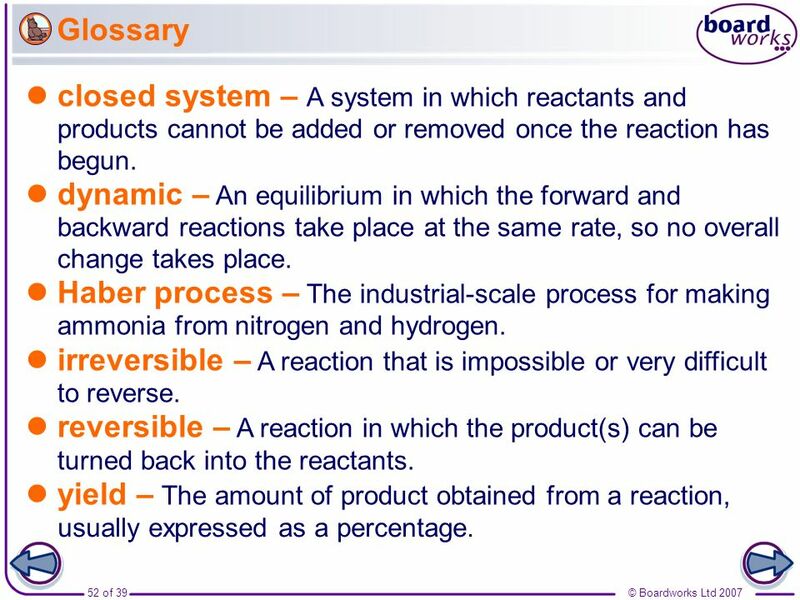 Glossary Boardworks GCSE Additional Science: Chemistry Reversible Reactions closed system – A system in which reactants and products cannot be added or removed once the reaction has begun. 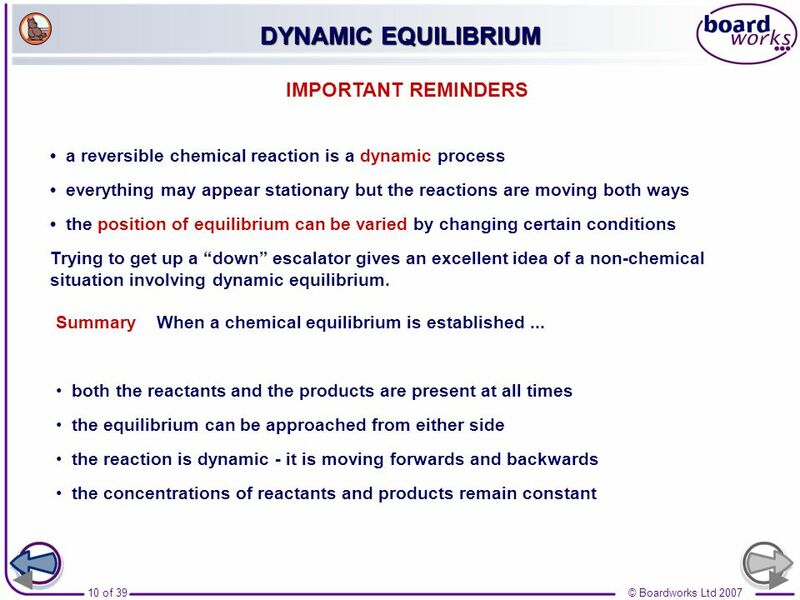 dynamic – An equilibrium in which the forward and backward reactions take place at the same rate, so no overall change takes place. 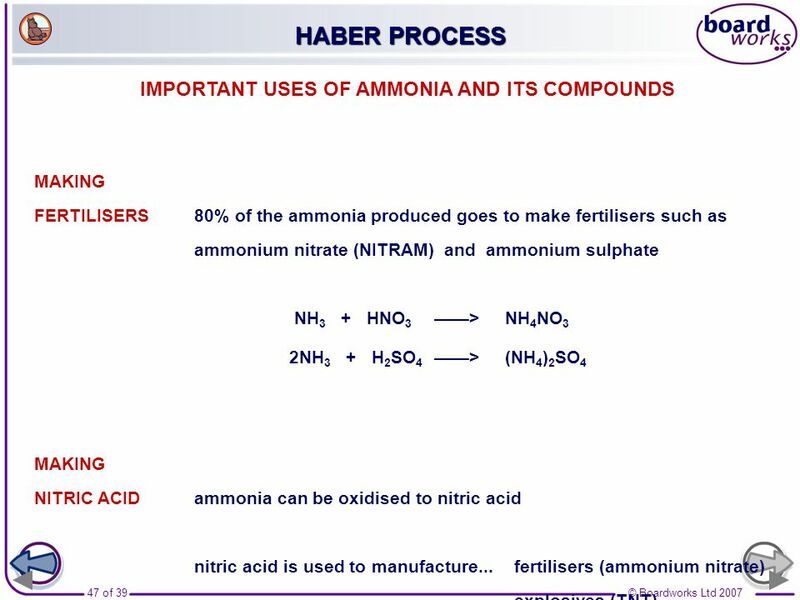 Haber process – The industrial-scale process for making ammonia from nitrogen and hydrogen. irreversible – A reaction that is impossible or very difficult to reverse. 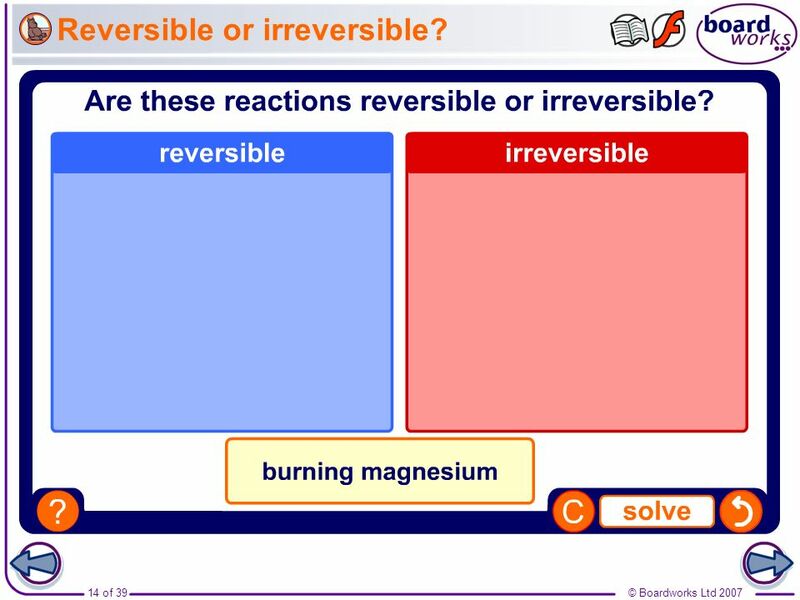 reversible – A reaction in which the product(s) can be turned back into the reactants. yield – The amount of product obtained from a reaction, usually expressed as a percentage. 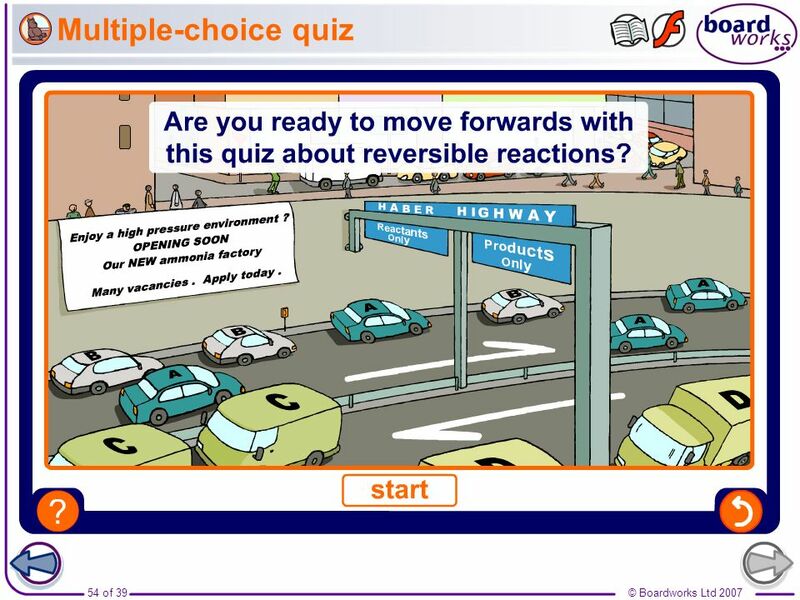 Multiple-choice quiz Boardworks GCSE Additional Science: Chemistry Reversible Reactions Teacher notes This multiple-choice quiz could be used as a plenary activity to assess students’ understanding of reversible reactions. The questions can be skipped through without answering by clicking “next”. 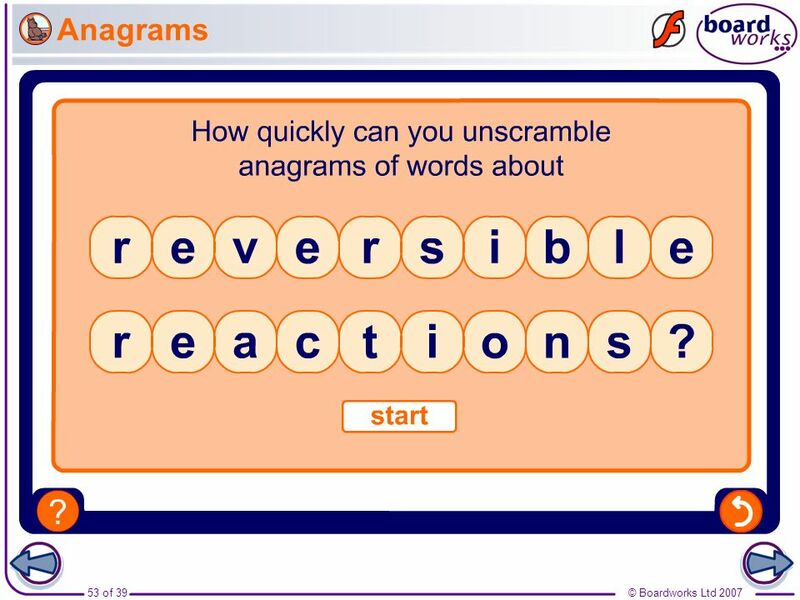 Students could be asked to complete the questions in their books and the activity could be concluded by the completion on the IWB. 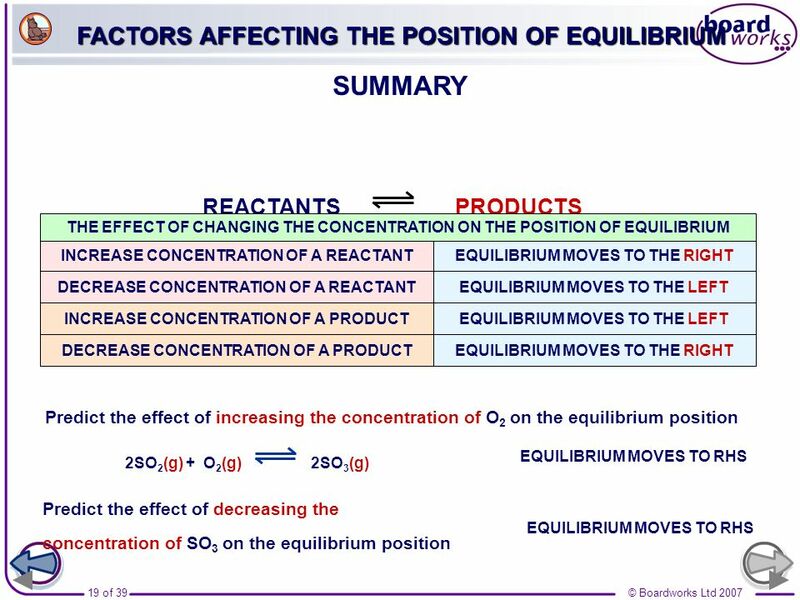 Download ppt "Boardworks GCSE Additional Science: Chemistry Reversible Reactions"
Chemical Equilibrium A B + A + C + B D A + B C + D 1. 4. 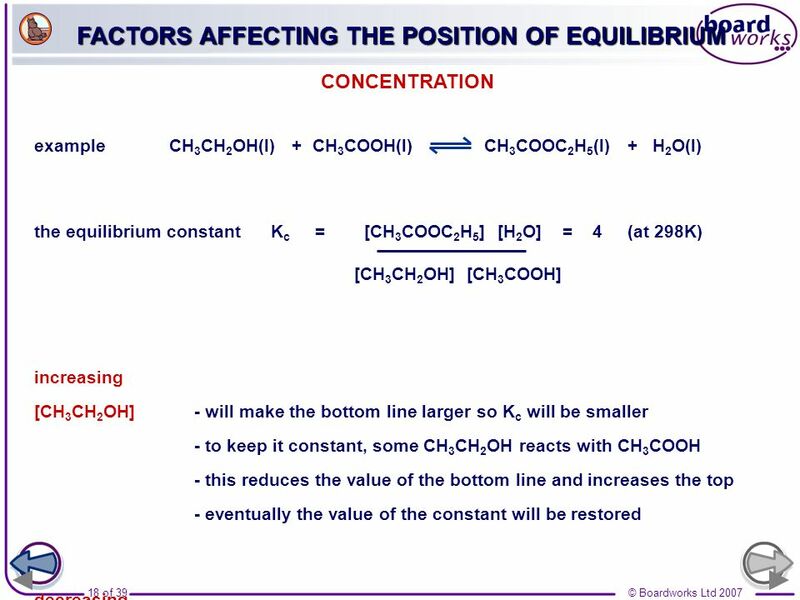 Introduction to Chemical Equilibrium Chapter 15 CHEM 160.